Our range of products include courier post bags. 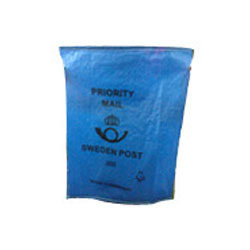 We are engaged in offering a qualitative range of Courier Post Bags to our clients as per their requirement. These are available in three types of bag such as Plain, with/without ropes inserted at top & bottom and with/without eyelets. Our range is high quality durable and is extensively used for courier, express, and mail services.